Anglo-Eastern Maritime training centre is a licensed training centre for the Maritime Resource Management Course developed by The Swedish Club. The course covers the mandatory training requirement laid down in the IMO International Convention on Standards of Training, Certification and Watchkeeping for Seafarers, 1978, as amended by the Manila amendments. The Maritime Resource Management course is recognised by the Maritime Department of the Swedish Transport Agency as meeting the above-mentioned requirements of the STCW 2010 Manila Amendments. This Course had its origins as the Bridge Resource Management Course adopted by SAS Flight Academy in conjuction with the Maritime organisations and administrations. It has been since expanded to cover situations on bridge, engine room and all over of the ship. This course deals with the Human element involved in errors committed on a ship. 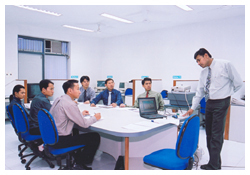 The MRM course is built on the modern day multimedia teaching method. 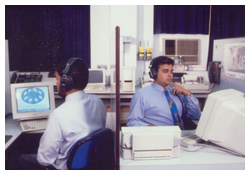 The centre is equipped with 15 PC's with each candidate having a dedicated terminal to himself. Each module is viewed by the candidate on a multimedia PC followed by a round table discussion, lead by the Workshop Facilitator to reinforce the behavioural and managerial aspects covered in the module. The learning is reinforced with numerous Case Studies, and on the last day, the candidates put the MRM principles into practice through exercise on a full mission simulator. 1. A-II/1 - Bridge Resource Management, Leadership and Teamworking Skills. This Training Program deals with management in highly operational situations like on board ship's bridges, engine and cargo control room, and the way human beings interact, communicate and make decisions in such situations. To enable use and co-ordination of all the skills, knowledge, experiences and resources available to the ships team to achieve the establish goals of safety and efficiency during voyages. To motivate the ships team members, and if neccessary, to chane their behaviour to good resource management.